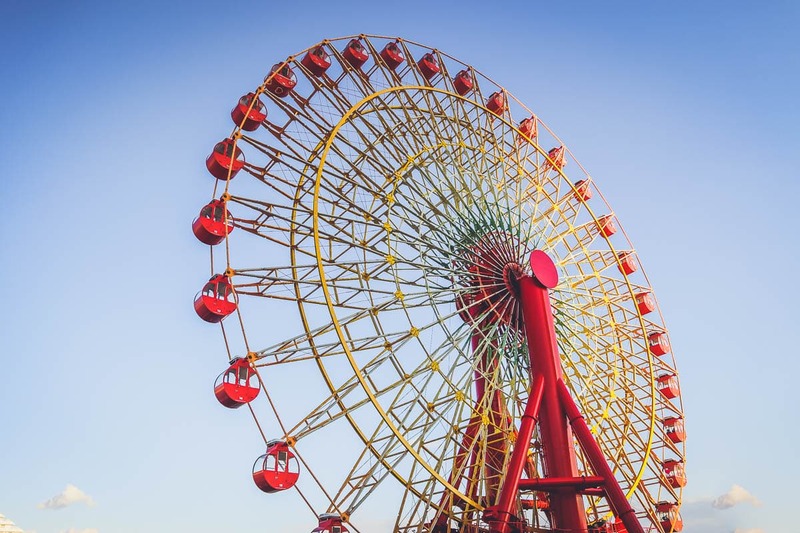 From taking in the views from Kobe’s Port Tower and the ferris wheel, to exploring the old district of Kitano or getting lost in colourful streets of Chinatown, these are the top things to do in Kobe, Japan. After my first trip to Japan last year, I was SO excited to be invited back to explore some more of the country. This time I was off to Kobe, a city around twenty minutes west of the metropolis of Osaka. So why go to Kobe, Japan? What is Kobe famous for? First up, the food. 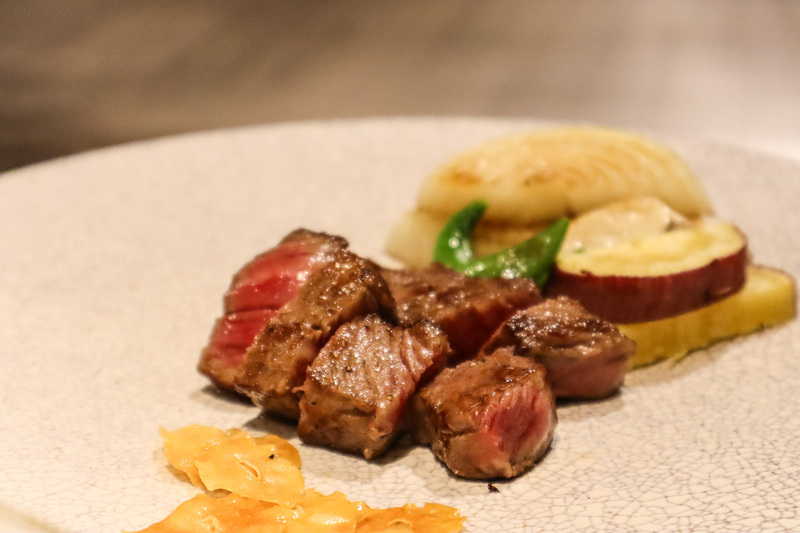 Kobe beef is reckoned to be some of the best beef in the world (more on that coming up). What else? Well this year is a particularly big year for the city. 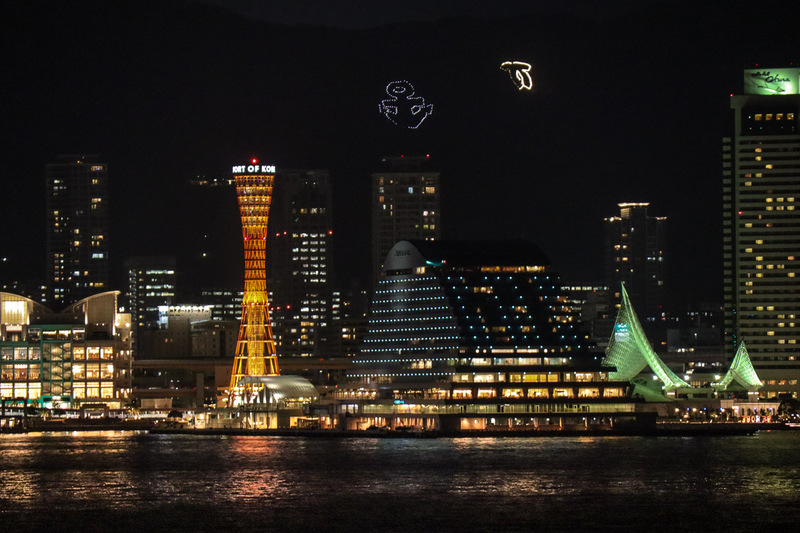 The Rugby World Cup 2019 is taking place this autumn, and Kobe is one of 12 host cities. In fact, England’s second match against the USA is taking place at Kobe Misaki Stadium. I imagine the atmosphere in the city will be incredible! 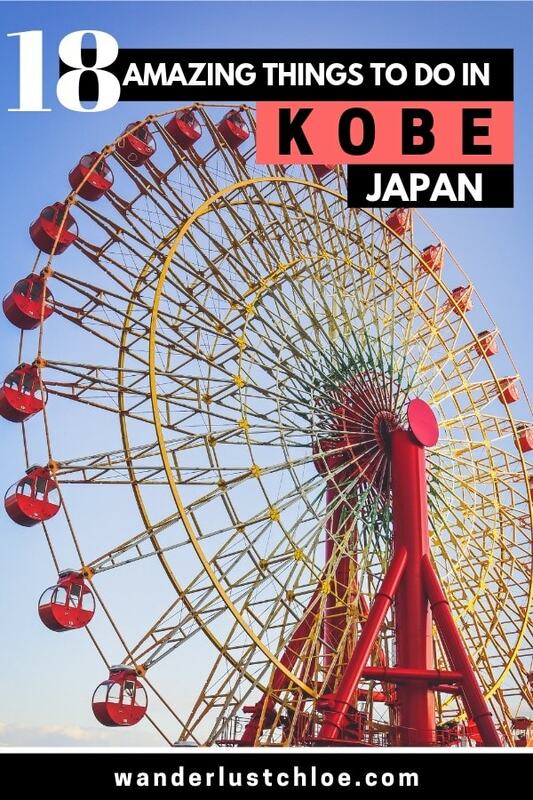 So whether you’re heading to Kobe for the Rugby World Cup and looking for a few things to do between matches, or you’re planning a visit for your next holiday, it’s time to show you the best things to do in Kobe, Japan! Watch the video, then scroll down to find out about what I got up to in Kobe! 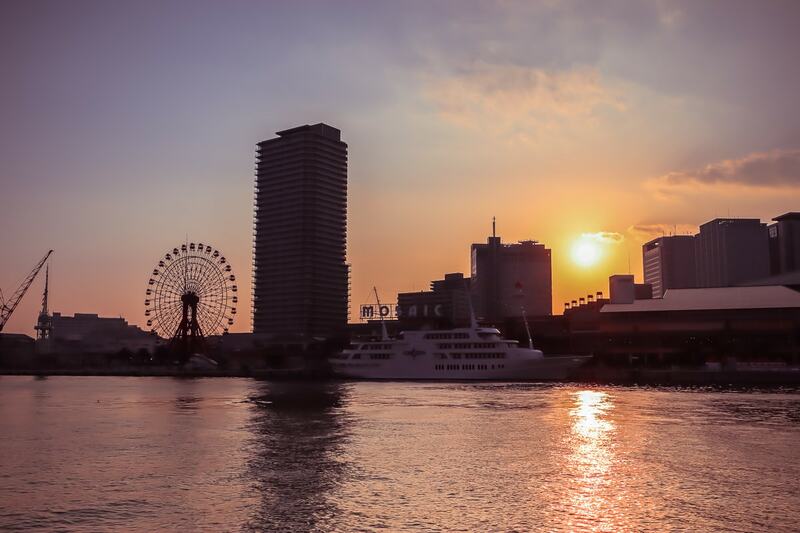 One of the highlights of my trip to Kobe was the Luminous 2 sunset cruise. Setting off late afternoon, we were treated to one of the most stunning sunsets I’ve seen in a long time. It was a great way to get a different perspective of Kobe and see how far the city stretches. Plus, it offered great views of Akashi Kaikyo Bridge – the longest suspension bridge in the world. But not just that, as the sun went down, the city’s twinkly lights switched on – the most magical view of all! 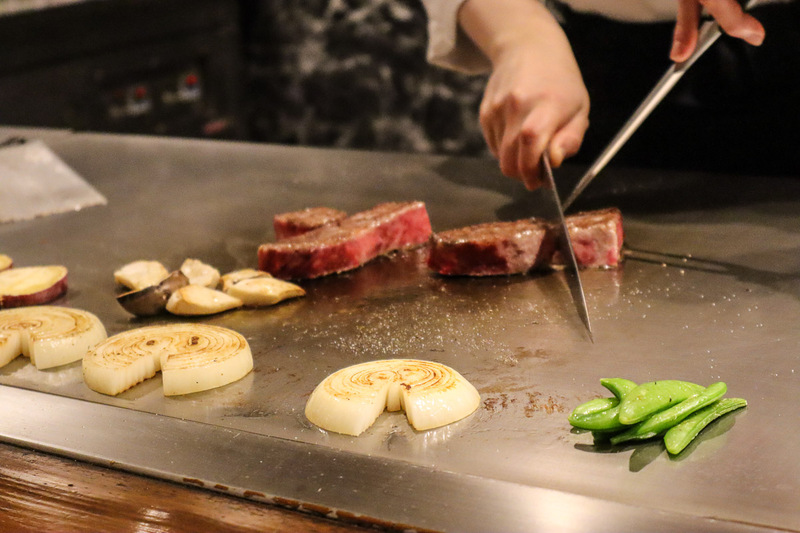 People travel to the city just to try the delicious Kobe beef, and before my trip, it was one of the only things I knew about the city! 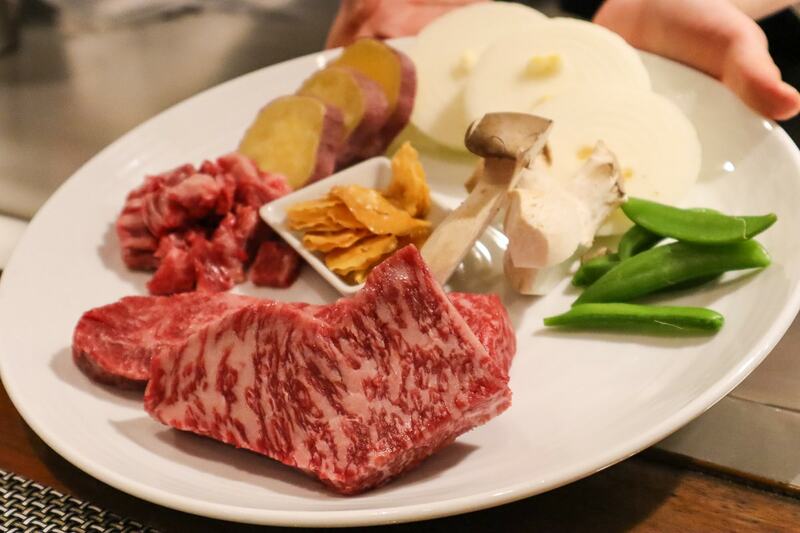 So why is Kobe beef so good? Well, Kobe beef is a type of wagyu beef known for its high level of fat marbling. It’s a soft kind of fat, with a low melting point, so it cooks quickly, stays very soft and tender and has a rich, indulgent flavour. It basically melts in your mouth. I enjoyed it at Kobe Plaisir, a restaurant I’d 100% recommend. They cook the beef right in front of you, which is very entertaining to watch. For ‎¥‎7,500 you can enjoy a large set menu including soup, salad, amuse bouche, rice and 100g Kobe beef steak. Trying beef here is one of my top things to do in Kobe. One minute you’re at Shin-Kobe station, one of the city’s major train stations, the next you’re standing in front of a stunning waterfall. Our hike to Nunobiki Falls was another highlight of my time in Kobe. I always think it’s so lovely to discover beautiful nature spots SO close to the city centre. 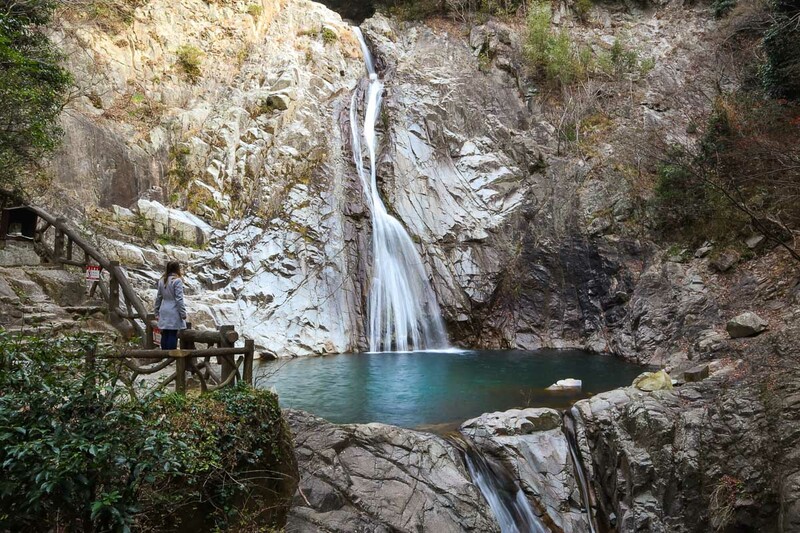 It’s the best thing to do near Shin-Kobe station, so even if you’re passing through and have some time free, don’t miss the opportunity to visit the waterfalls. There are a few waterfalls to see, with Ontaki Falls being the largest. 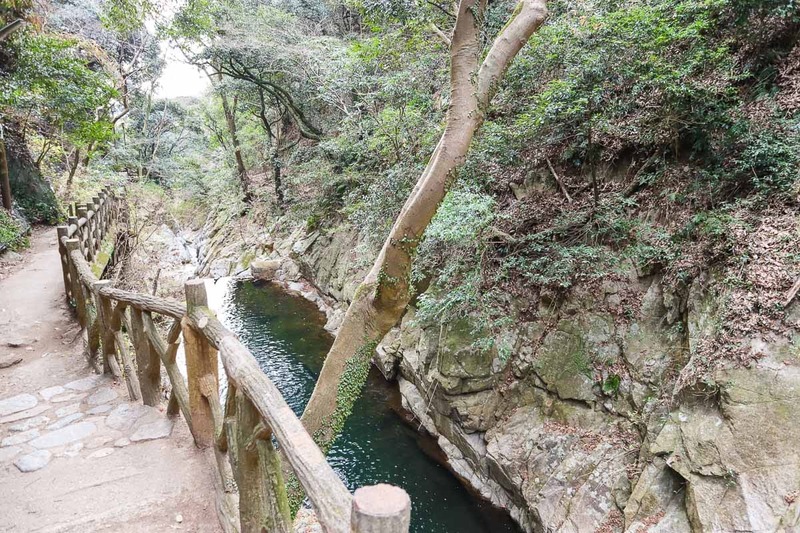 There’s a great hike along well-made paths to get there, plus you can keep hiking up to a spectacular viewpoint of Kobe, then to a reservoir. If you don’t fancy the hike up or down, you could catch the Shin Kobe ropeway – a cable car that links a few of the points around Mount Rokko. Merikan Park gets its name from when the Americans docked in Kobe and set up the US consulate moments away from this spot. It’s a big open space, with lots of places to wander around. 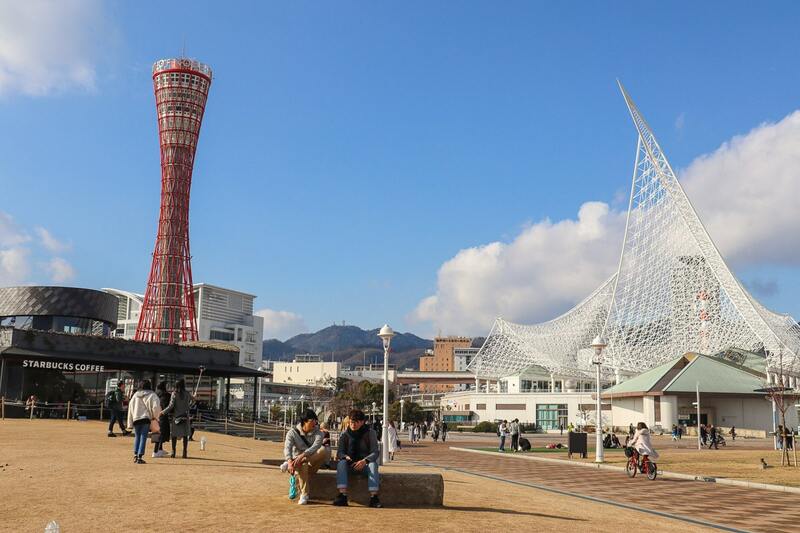 If you like modern architecture, you’ll love Kobe Maritime Museum, with its interesting sail-like architecture, and the iconic Kobe Port Tower. 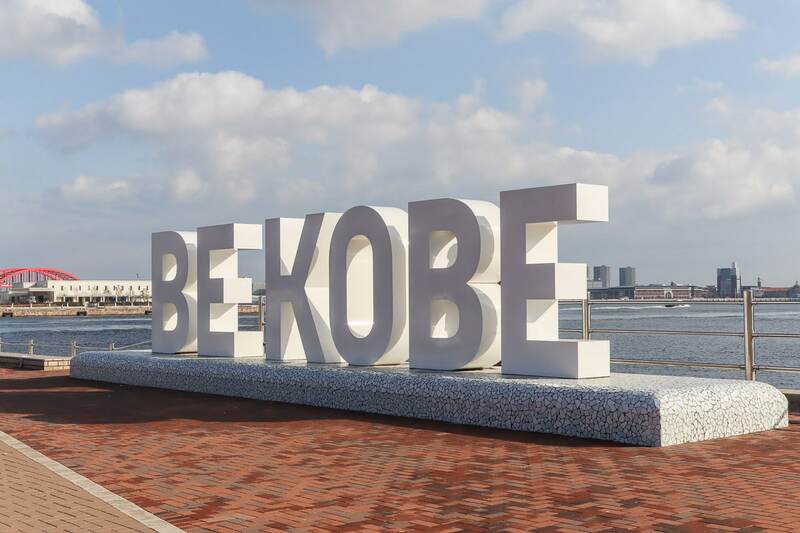 There’s also the ‘Be Kobe’ sign, which gets busy at weekends, with people queuing up to snap a photo there! It’s also where Kobe’s fan zone for the Rugby World Cup 2019 will be set up. 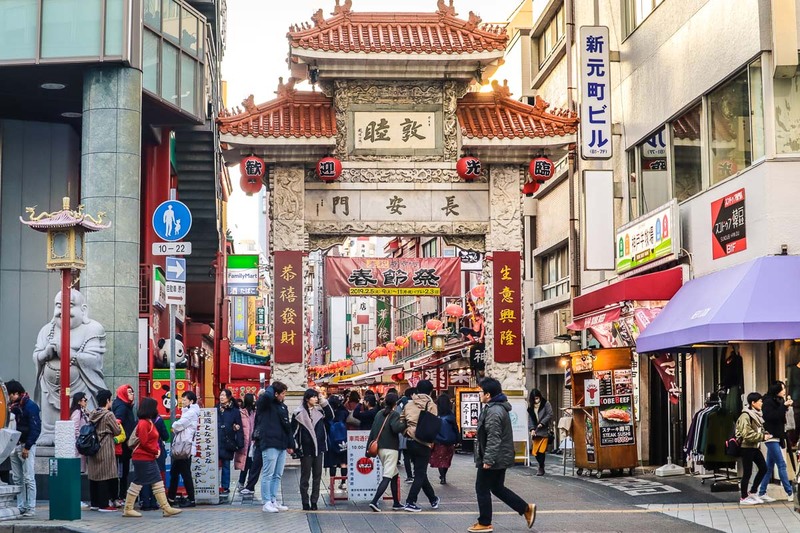 I really enjoyed exploring Chinatown in Kobe, known to locals as Nankinmachi. 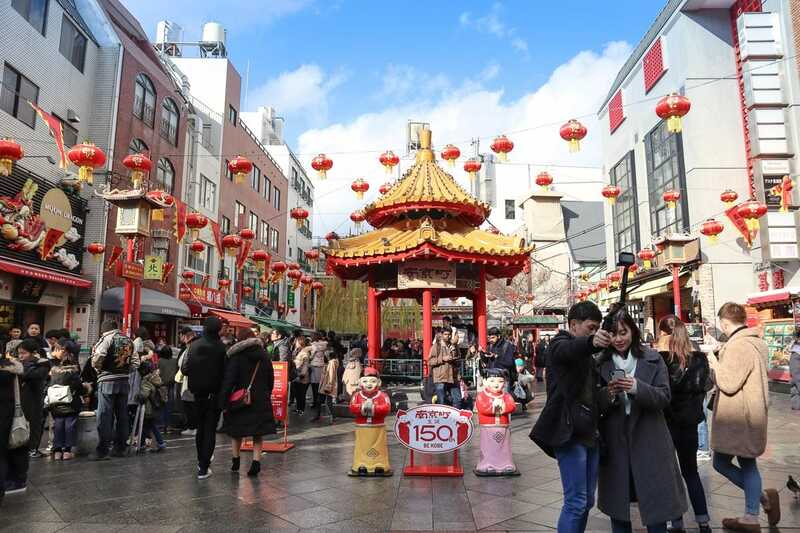 There’s one main street, with big gates at each end, plus a square with a Chinese temple and strings of traditional red lanterns. If you like food, then there’s SO much to take in! 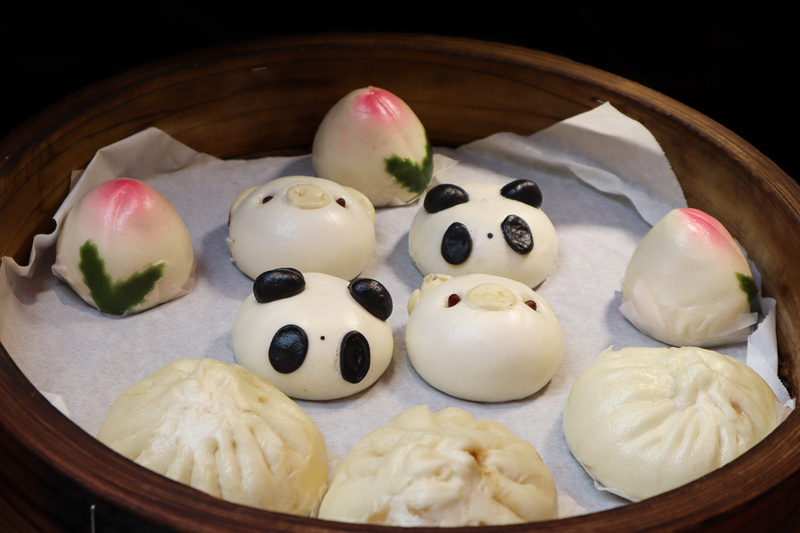 From dumplings in the shape of pandas, to steamed rice parcels and sugarcoated strawberries, it’s a fun place to grab lunch. We stopped off for a tasty meal at Minsei restaurant in Chinatown – somewhere recommended by a few of the locals. There are also souvenir shops and supermarkets, in case you fancy picking up any gifts! 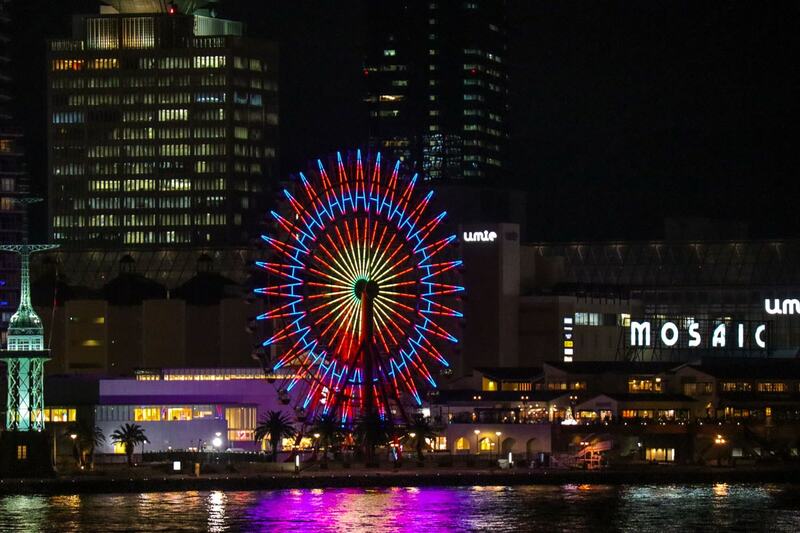 What to do in Kobe at night? Head to Sone! 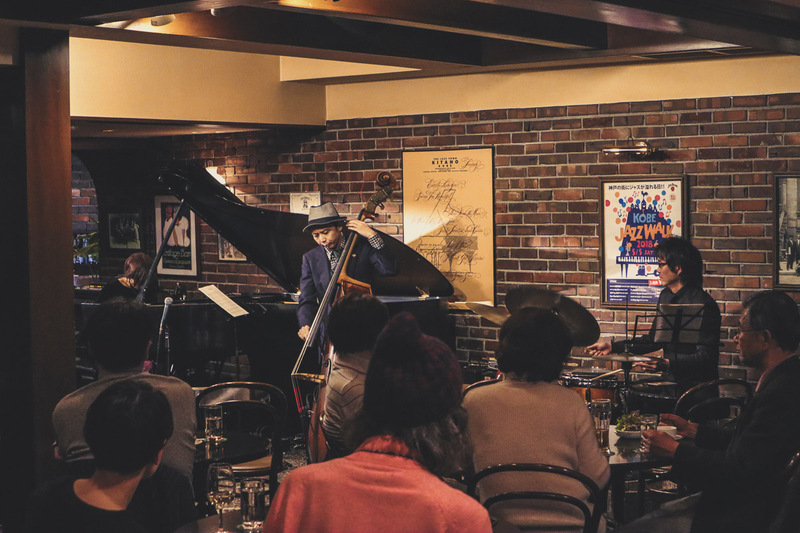 One of the best live music venues in Kobe, Sone Jazz Bar and Restaurant is THE place to see the very best jazz musicians in the city. There are nightly sets, in a relaxed restaurant/bar setting. We enjoyed a three-course meal, metres from the talented musicians. It was a really lovely experience! As a self-confessed ramen addict, I couldn’t wait to devour a bowl of ramen within hours of arriving in Kobe! 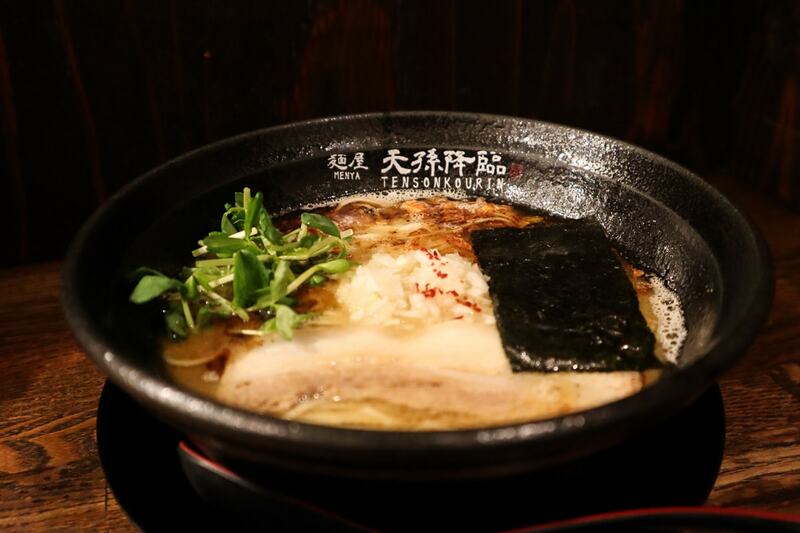 One of the locals recommended Tensonkourin, moments from Sannomiya Station. The ramen was really tasty, with a pork-based broth, seaweed and perfectly cooked noodles. I’ll admit it was a little hazardous buying our ramen tickets from the machine without any English translation, but that’s all part of the fun of visiting Japan! Along with this one, I’d recommend Ichiran and Ippudo (2 ramen chains) from my previous trip to Japan. 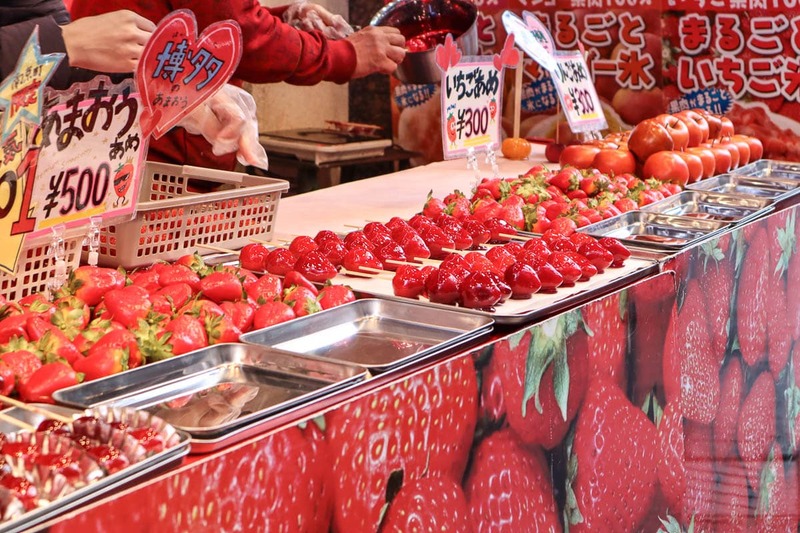 Along with trying plenty of local delicacies including fish, seafood and Kobe beef, there are plenty of quirky delicacies for sale too! 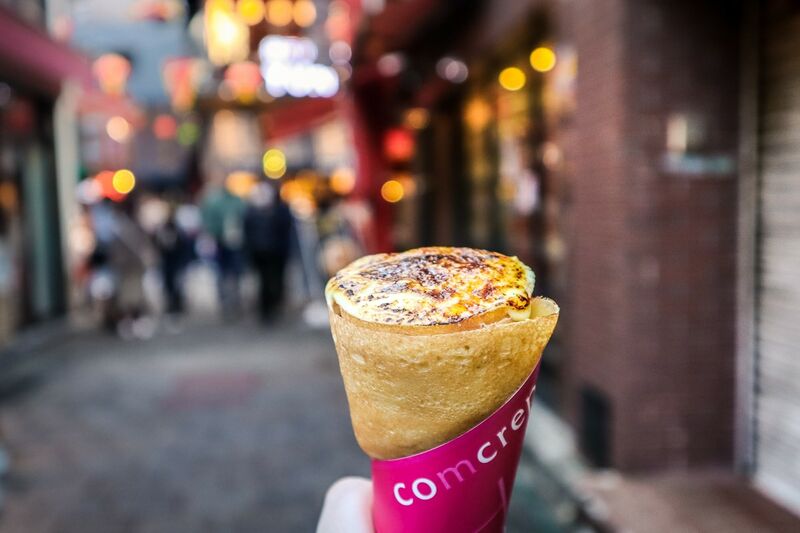 ComCrepe is located on a side street between Motomachi’s busy shopping street, and Nankinmachi (Chinatown). This tiny shop’s most famous crepe is the ‘crème brulee in a crepe’, complete with that crisp bruleed top! Delicious! Walking around Kitano might not be a highlight for western tourists, as it doesn’t feel very different to being at home! But, don’t let that put you off, as it’s very pretty and definitely one of the top places to visit in Kobe. It’s the neighbourhood where western merchants and diplomats settled after arriving through the Port in the 1800s, so there are several historic mansions to look around. 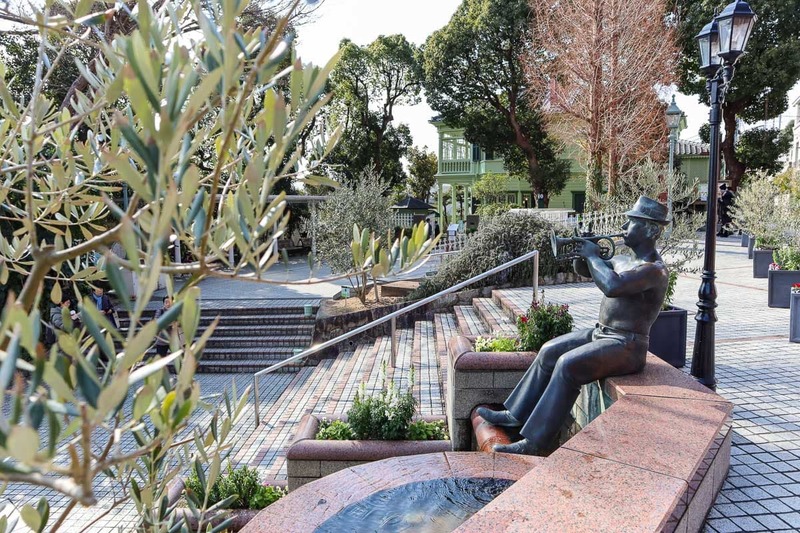 There are also some cute cafes, tourist shops and a nice paved park area with sculptures and olive trees too. I never felt overwhelmed in Kobe as I did in cities like Kobe and Osaka. I felt that the city had a nice pace to it. Saying that, at night it certainly cranks up a notch. 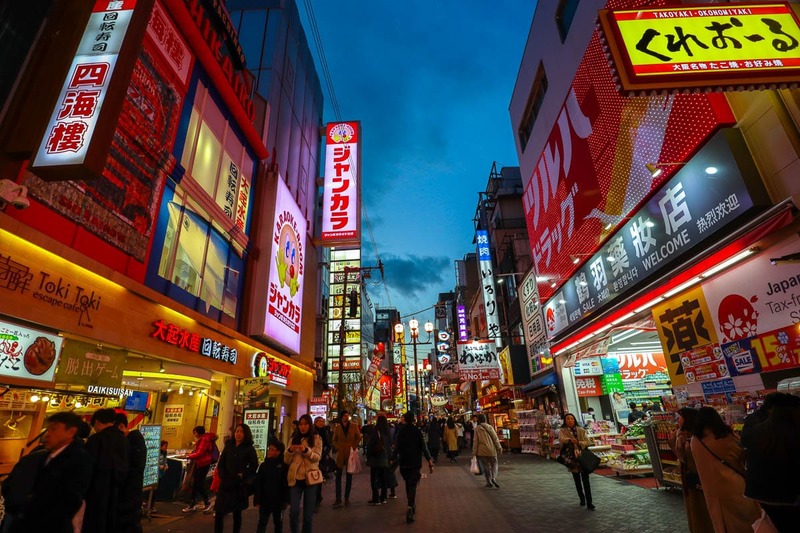 If you’re looking for things to do in Kobe at night I’d suggest spending some time a few streets back from Sannomiya Station – it’s a fun area in the evenings. 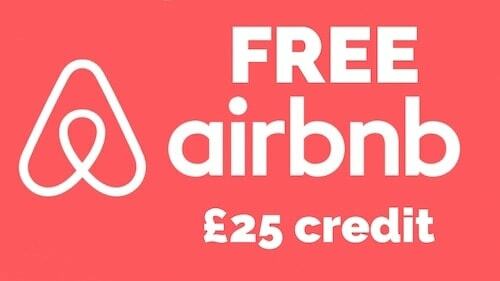 So what’s on offer? Well, there are lots of ‘hole in the wall’ eateries, serving everything from Korean fried chicken, to burgers and sushi. There are 10-floor towers with bars and restaurants on each floor. Oh and there are plenty of places to enjoy Japan’s favourite pastime – karaoke! 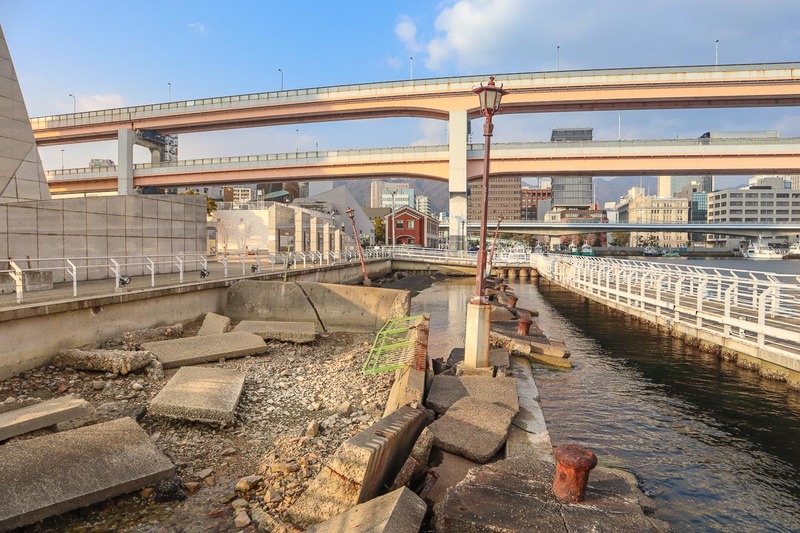 As you wander Kobe’s streets, it’s hard to believe that in 1995 a huge part of the city was destroyed in the Great Hanshin Earthquake. Over 6,000 people died, many from the city itself. It’s a hugely sad memory for many, so if you do visit Merikan Park, take time to visit the Earthquake Memorial Park. While the rest of the city was reconstructed, this one small area was left in its damaged state, as a poignant reminder of the power of natural disasters, and how the city has rebuilt itself since. Packed full of a variety of shops, Motomachi is a must-visit on your Kobe city trip. Crossing several streets, the covered shopping arcades are a great place to pick up some gifts, shop for clothes or pick up a few daily essentials. 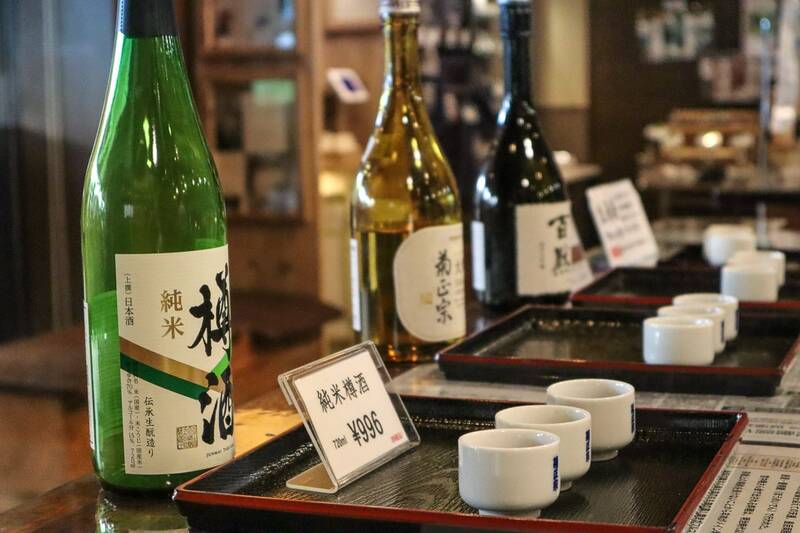 Kobe is a key player in the sake world, and much of the country’s best sake is brewed in the area. What makes it so good? Access to high quality rice, clean water from Mount Rokko and good weather conditions. We spent a morning at Kiku-Masamune where we enjoyed a tour of the museum, saw skilled craftsmen at work making the sake barrels, and then got stuck into a sake tasting. I’ve never been much of a sake drinker, but it was great to try several and distinguish the differences. I really liked the one that was aged in sherry barrels, with its mellow, woody flavour. There are a few options if you’re looking for ultimate views of the city… You could head to the ferris wheel in Harborland. Views are pretty as you look over the water to the built up city centre. 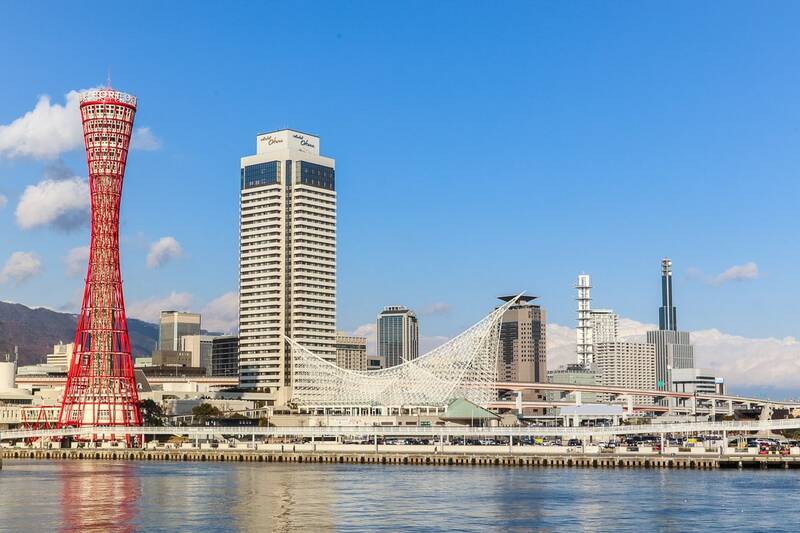 Or you could head up to one of the higher floors in the city’s icon – Kobe Port Tower. Or for a free view, I heard the observation deck at Kobe City Hall is hard to beat! 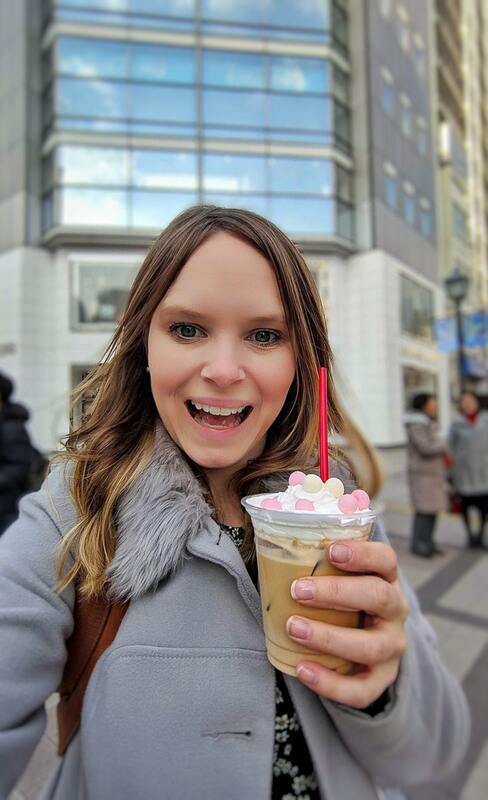 Continuing the quirky treats on offer in Kobe, if you’re wandering around the Motomachi shopping district, stop off for a coffee with a twist at Jessy’s Coffee Shop. 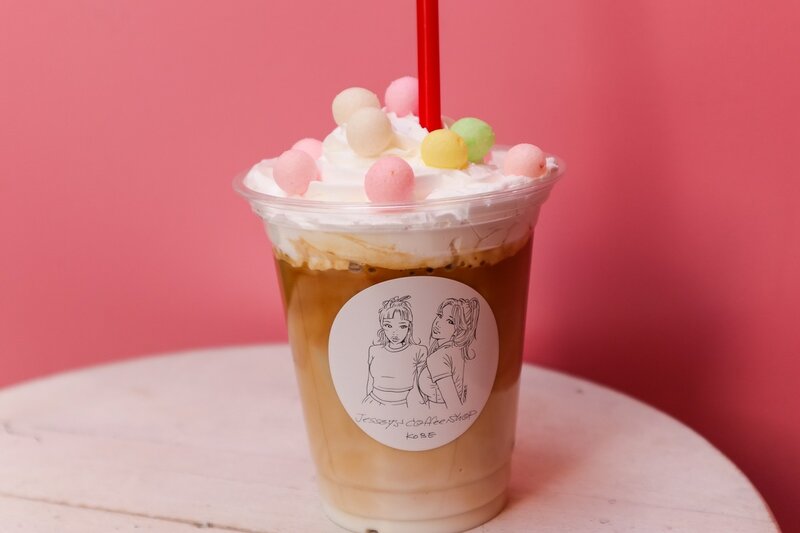 I went for the ponpon latte – a coffee topped with whipped cream and colourful sugary balls! If you’re looking for somewhere with lots of food options, Kobe Harborland has it all. 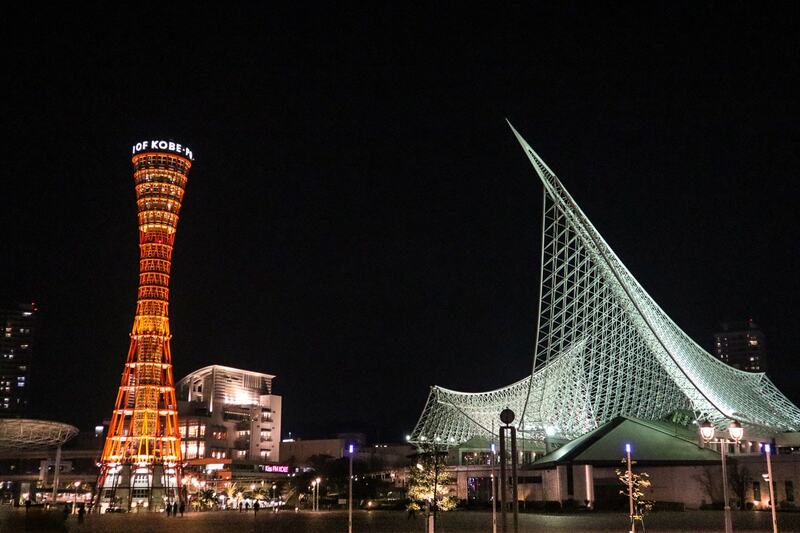 Relatively new, it’s now one of the top places to visit in Kobe. It’s in a lovely location right on the water, with views of Kobe Port Tower, tourist boats, and when I visited there was an ice rink too. 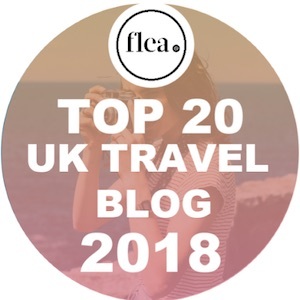 There were lots of trendy restaurants and cafes serving up a number of different cuisines including Italian, Hawaiian and of course Japanese to name a few! 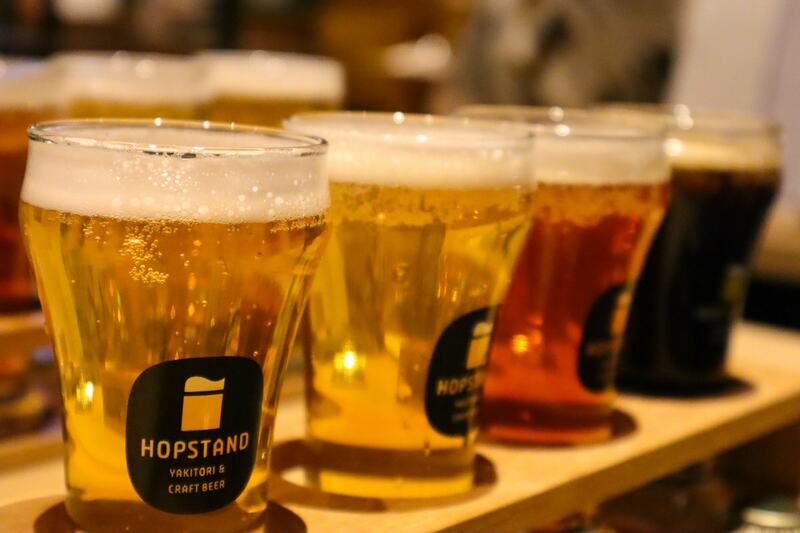 One evening we ate at Hop Stand – a restaurant specialising in yakitori (skewers of meat) and local craft beer. As mentioned, Kobe is gearing up for a BIG autumn, as one of the host cities of the Rugby World Cup 2019. Several games will be taking place at Kobe Misaki Stadium. It’s the first time that it’s been held in an Asian country, and the first time outside of a tier 1 nation. It was lovely chatting to people in and around Kobe, and hearing their excitement for the games. Hopefully lots of people will visit during this time, and base themselves in Kobe. When I last checked there were still tickets available. 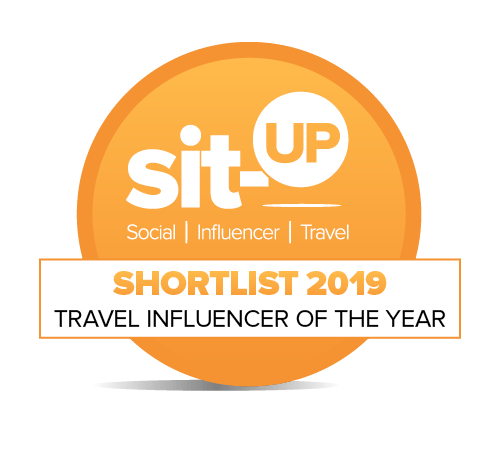 So I’ve shared some ideas for what to do in Kobe, but what else is there to do in the Kansai region? With such an efficient train network, it’s really easy to base yourself in Kobe and explore some other amazing places. 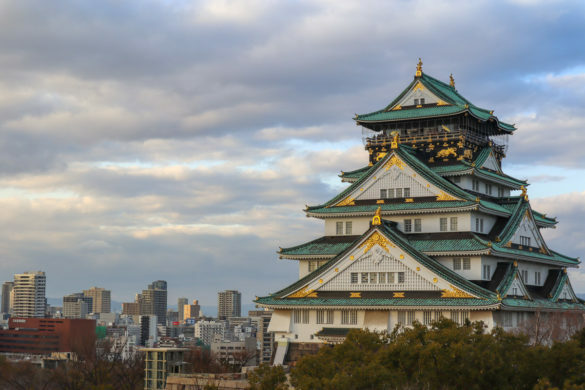 You can travel from Kobe to Osaka in around an hour, and once there I’d recommend splitting your time between Osaka Castle and the vibrant area of Dotonbori. The city of Himeji also has a beautiful castle (one of the most famous in Japan!) along with beautiful Japanese gardens. A highlight was our trip to Arima Onsen, one of Japan’s premier onsen towns. We spent an afternoon relaxing in the hot springs and enjoying traditional ryokan food. 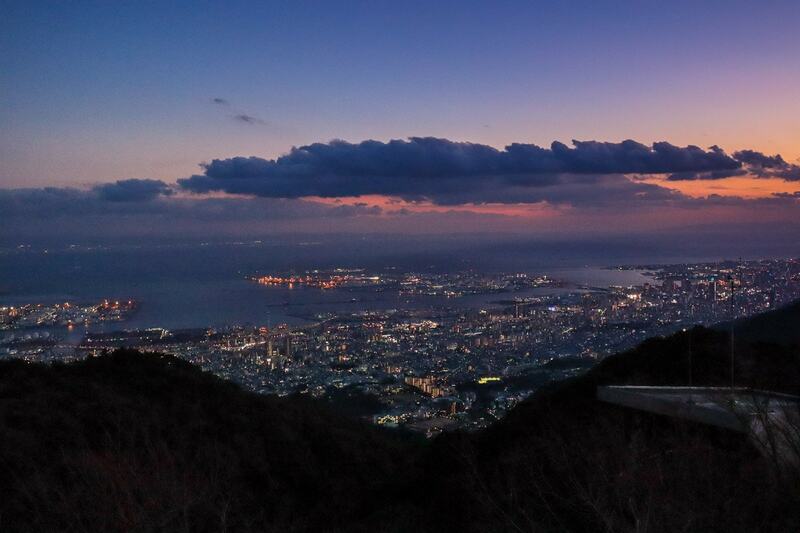 Or for some of the best views of the Kansai region, I’d recommend taking the cable car up to the top of Mount Rokko. There’s a great observatory up there, plus a café, restaurant and gift shop. 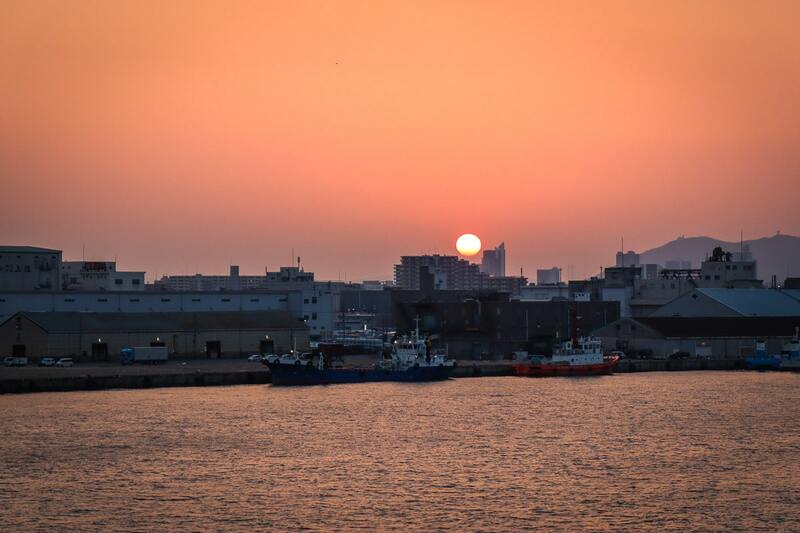 Watching the sunset over Kobe and Osaka was absolutely magical! How to get to Kobe, Japan? If you’re travelling from abroad, the easiest way to get to Kobe is to fly into Osaka Kansai Airport. The bus from Kansai Airport to Kobe takes just over an hour and costs ‎¥‎1,950 (around £13). There’s also the Kobe-Kansai Airport bay shuttle service – a high-speed ferry that links the airports. We couldn’t experience this on the day we arrived as the weather wasn’t great, but I saw they were running a promotion for foreign visitors, costing just ‎¥‎500 per ticket. From Kobe Airport, you can then hop in a taxi or on the train. You can also travel from Tokyo to Kobe by train (hurrah for those speedy shinkansen services! ), which takes around three hours. 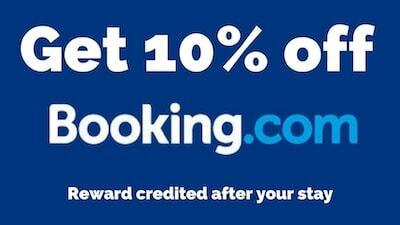 Don’t forget to reserve a seat in advance if possible. Find out why in my Japan for first timers guide – guaranteed to help you avoid awkward situations on your trip! A big thanks to Visit Kobe for inviting me to explore the region ahead of the Rugby World Cup 2019! As always, all opinions are my own.